Gupta Empire Roads: The Gupta Empire was named after the Gupta dynasty which ruled approximately between 320- 550 CE. 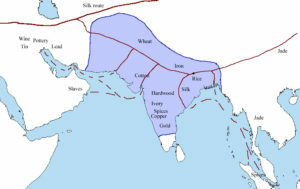 The Gupta dynasty period is regarded as the Golden Age of India. Roads were very important during the Gupta Empire period as they are today. During the Gupta period, the village roads were built between houses and were often narrow as compared to the ones in cities. 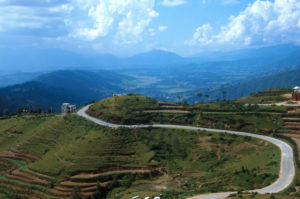 One of the important uses of the roads was to improve the trading activities on the Silk roads of the Gupta Empire. The usage of roads for transporting goods from one place to another considerably increased the trade and commerce activity in the Gupta period. The increase in the supply of goods also meant that there was more demand for them. The goods were transported not only within the territories of India but were also transported to foreign countries. The availability of roads largely contributed in boosting the economy of the Gupta Empire. The materials used to build roads during the Gupta Empire period were brick and hard packed dirt. These materials made the roads more durable and thus the roads remained intact for a long time. The roads during the Gupta period were built a few feet higher than the ground level. The reason for building the roads at a raised level was to easily enable the rain waters to flow down from either side of the road and thus there will not be any saturation of rain waters on the roads. The engineers were appointed to look after the road building work. The roads during the Gupta period were properly measured and marked by the engineers. The people involved in building the roads were paid for their work. The roads of the Gupta Empire not only helped in carrying out trade and commerce but they also connected different parts of the Empire and made traveling a lot more convenient.